Fullspectrum is able to produce high quality electrographic images of almost anything. Great for all kinds of promotions from music to green tea! 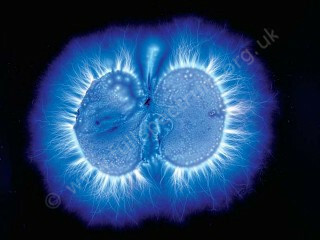 If you want to illustrate the dynamic quality of your product or service Kirlian photography does it like no other medium can. Our startling ‘before and after’ of fruit, fresh and microwave, will have you reaching for the fruit bowl. We are always willing to discuss new and interesting projects both artistic and scientific. 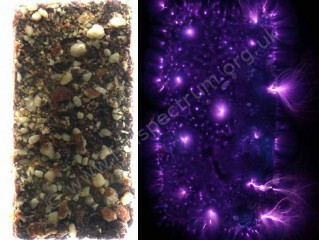 Experiments of the ‘before and after’ nature are particularly effective. We have recently photographed a range of fruit, before and after it was cooked by the microwave method, with startling results. 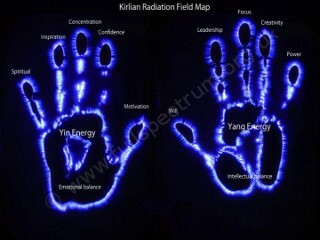 Kirlian photographs before and after various energy drinks, exercises, organic food, therapies etc can visually demonstrate an increase in energy that confirms the subjective experience of an increase in the sense of well-being. See how you feel! Richard Booth and Nigel Hutchings bring a bold statement and refreshing perspective to a range of everyday subjects. Their images illustrate the subjects as belonging to the worlds of both matter and energy. 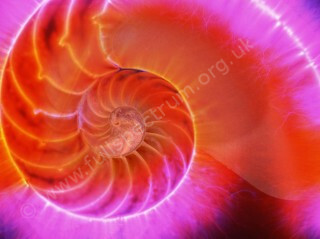 Fullspectrum have a range of spectacular images available for advertising & media use. Individual and unique images can be commissioned.